Getting a bit ahead of myself here, having only had 3 lessons so far. But looking to the future, how do syndicates work. Then there is lets say £100 a month fees for hangerage, maintanace etc. I can understand that some of that covers fuel, but your not likely to burn that much in an hour. I would have thought that once you had paid for your share of the aircraft then you would have the use of the aircraft for costs only on an agreed basis?? It depends. There are fixed costs and variable costs. The fixed costs will include a certain amount of maintenance for time related events, the annual inspection, etc. Then the variable costs are those which are hour dependent - 50 hour inspections, engine overhauls, things that wear out the more they're used, brake pads, tyres, etc. Some groups will split the costs as and when, but others will build up a fund so that people don't have a sudden "cash call" or that cash calls are minimised. Paul_Sengupta wrote: It depends. There are fixed costs and variable costs. The fixed costs will include a certain amount of maintenance for time related events, the annual inspection, etc. Then the variable costs are those which are hour dependent - 50 hour inspections, engine overhauls, things that wear out the more they're used, brake pads, tyres, etc. Some groups will split the costs as and when, but others will build up a fund so that people don't have a sudden "cash call" or that cash calls are minimised. The above assumes that all users own the equity of the aircraft between them on a percentage basis ("equity shares") and are all responsible for bills. Not all groups have contingency funds. Some expect the users to just stump up the cash when big bills (like engine) come in. ... or alternatively, the aircraft will be owned by one person and effectively rented out for a monthly & hourly fee as above. These tend to be higher than the previous scenario as all the big bill land at the feet of the owner as he owns all the equity in the aircraft. The advantage the the sharees is that they know that they are not responsibly for new radios, transponders, engines etc. These would be "non-equity" shares, and the advantage to the sharees is that they know that they are *not* responsible for all these bills, and neither are they responsible for arranging maintenance etc. Can you imagine how much debate there has been in equity groups up and down the land about new transponders (ADSB in / out/ etc.) 8.33kHz radios etc over the past few years. It wouldn't surprise me if some groups imploded over this. It's often said that that the people in the group are as important as the aircraft. PaulB wrote: The above assumes that all users own the equity of the aircraft between them on a percentage basis ("equity shares") and are all responsible for bills. Which to be a fair to Paul, is what the OP describes. But he also spoke of buying an aeroplane and sharing it out. There’s a hint there that it may be something other than equal equity ownership. Also if it is qoing to be equal equity, he may want to get the group together first then buy the aeroplane as a group. 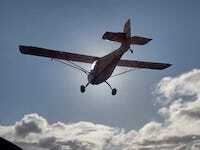 PaulB wrote: But he also spoke of buying an aeroplane and sharing it out. There’s a hint there that it may be something other than equal equity ownership. PaulB wrote: Also if it is qoing to be equal equity, he may want to get the group together first then buy the aeroplane as a group. That's a novel thought. I wonder what the success rate for that route is? I'd suggest that is not the way forward. Providing the OP can afford to buy it, then do so and sell shares thereafter. No compromising on what you buy and others have something tangible to see when parting with their cash. Needs to also be able to afford for shares not to sell. Yes, I read his post as he can…he's a farmer after all. In no time he'll have several!! One important point that seems to have been overlooked........A microlight registered and permitted through the BMAA, must have every syndicate- member to be a paid-up member of the BMAA. I am not sure if this applies to non-equity syndicates (which seem to be little more than a contracted commitment to pay "x" pounds a month, whether you fly it or not. AIUI, some charge an hourly rate, inclusive of fuel (IMHO, an incentive to thrash it ) others, "leave it full" so you pay your own fuel cost. Then there's landing-fees, parking,and, as mentioned, the cash-call, if a wear/tear/ lifed expiry charge is not built- into the hourly rate. I make the presumption that "share for sale" adverts include the share's "credit" in any accumulated fund,so if the engine "pops" just after you bought your share, you won't have to find several thousand? If the fund has a shortfall, how is liability-level established? Fairest would seem to be, divide the shortfall between the total hours flown since ownership , then each shareholder paysthat surcharge according to the hours his /her share has flown.........not a problem for a buyer of a share who's owners have rarely used it, but an issue for the new holder who's share has clocked lots of time. I am not, and never have been in a syndicate, but have seen these issues and similar with yachts and boats. I am also not a qualified pilot or yachtmaster. Miscellaneous wrote: Yes, I read his post as he can…he's a farmer after all. In no time he'll have several!! ... and there was me believing the hype and paying extra for milk to help Britain's impoverished farmers! Obviously if you can afford to buy an aircraft and run it yourself, then this is best as you'll know exactly what happens to it. If you're sharing it out, you can either go for the equity option which is effectively selling half of it to someone else (or a third each to two other people etc.) and you all become co-owners equally responsible for the maintenance and decisions regarding upgrades etc. and paying equal shares of those costs. Alternatively you could go down the "non-equity" shares route and effectively let other people fly your aeroplane for a set fee that you decide (monthly and hourly). The plane remains yours, so if the engine blows up it'd be down to you. Both probably need written agreements. If we disregard microlights for a moment, let's say you're talking about a share in a PA28, which would burn about 35 litres an hour for instance. 35 litres, at £1.90 a litre is 35*1.90 = £66.50. And that's if all the pilots lean it properly at all times, otherwise the fuel burn will be more. Let's say the engine TBO (time between overhauls) is 2000 hours. Let's say the cost of an overhaul, with removal and refitting is £25k (it can be more). 25000/2000 = £12.50 per hour. Magneto overhauls, £1000 for 500 hours, £2 an hour. 50 hour inspection, let's say £500 in round figures, £10 an hour. Then there's tyres, brake pads, etc, you can see how it builds up to £100 an hour or more. None of this plans in for things breaking or going wrong, avionics upgrades, etc, which could be cash calls or the rates could be increased to build up a bank balance for such eventualities. Not that difficult, fixed costs (hangarage, annual, insurance, etc) shared in monthlies, variable costs shared in hourlies. Glad I am going down the microlight route, hopefully a bit less money? ?